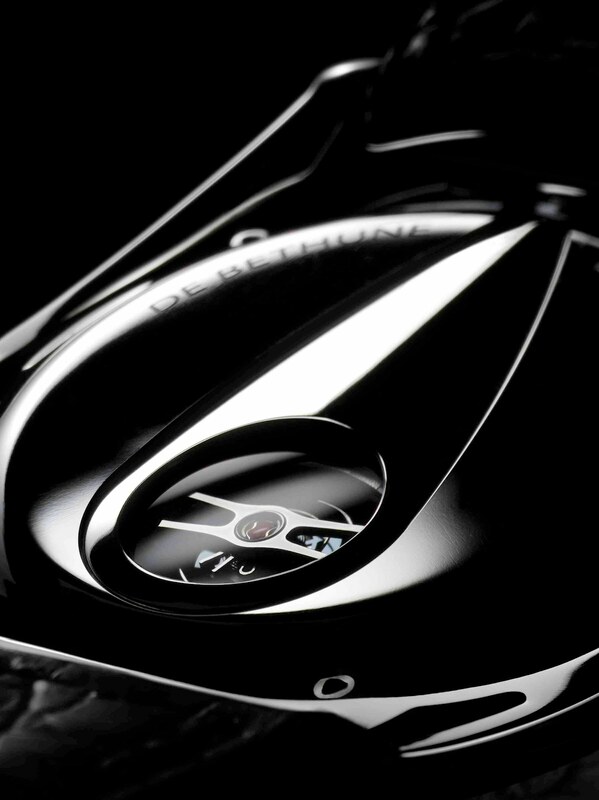 On the occasion of its 10th anniversary, the Manufacture De Bethune presents all devotees of Haute Horlogerie with the Titan Hawk, the first creation in its new DB27 collection. This latest model, featuring finely crafted lines and elegance that may be admired from both sides, testifies to an ongoing aesthetic quest that David Zanetta, who designed this creation, defines as “dedicated to serving beauty through the readability and functionality of the object”. In the village of L’Auberson, expert hands meticulously craft the grade 5 titanium, displaying perfect mastery of the delicate mirror-polishing technique gracing the case, the floating lugs and the domed back of the Titan Hawk. The floating lugs are fitted with a patented system of springs that enables the watch to adjust to the wrist and to its wearer’s movements, in harmony with De Bethune’s consistent concern for comfort and for cutting-edge aesthetic appeal. The silver-toned colour of the grained dial sparkles in the centre thanks to the microlight accompanying the central calendar read-off, surrounded by a chapter ring and minute circle featuring a rounded shape and raised numerals. 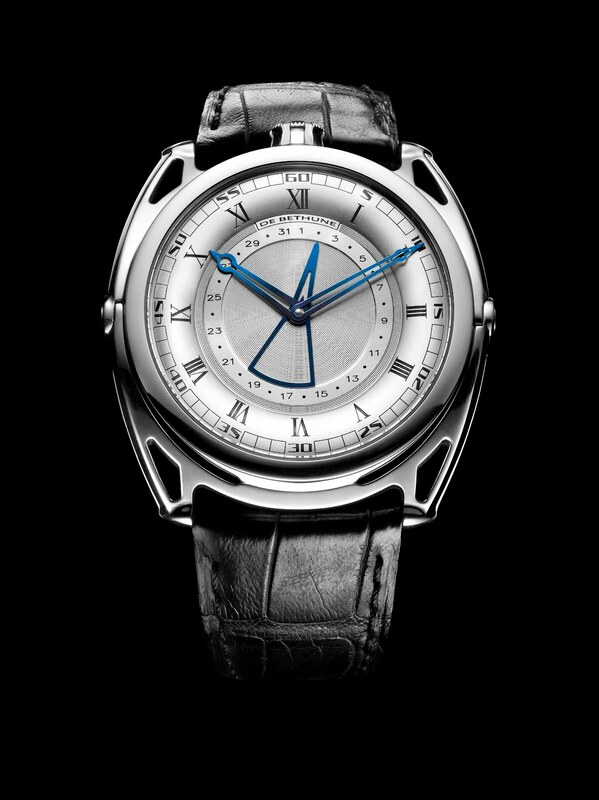 The cut-out hands including the atypically shape date pointer are in steel, hand-polished and flame-blued in the De Bethune workshops, where time-honoured know-how is combined with technical mastery and artistic genius. The DB27 Titan Hawk is equipped with a mechanism boasting the kind of proven technical features dear to Denis Flageollet, who continues to broaden and perfect the technical knowledge of the Manufacture. The silicon and white gold annular balance wheel revealed through the case-back powers the latest self-winding in-house calibre – driving the central hour, minute and date functions – named S233 after the specific gravity of silicon. This ideally modular movement incorporates the main De Bethune technological breakthroughs, making it the most complete calibre of its generation. The power of this majestic bird of prey will firmly grasp the wrists of watchmaking enthusiasts, aesthetes and fervent devotees of fine mechanisms – all of whom will be able to appreciate on a daily basis the lightness, sturdiness, aesthetic finesse, comfort and reliability of this model epitomising the inimitable De Bethune expertise and technology. Self-regulating twin barrel* – The barrels are specifically designed to eliminate friction and efficiently transmit a maximum of energy. Silicon/white gold balance wheel* with flat terminal curve – Its exceptional lightness enables this balance wheel to reduce mechanical friction and deliver an ideal inertia/mass ratio. The principle of the flat end curve, placed on the same level as the balance-spring, compensates for off-centering and facilitates its fastening. Triple pare-chute shock-absorbing system* which reduces potential disturbances due to impacts to an absolute minimum and protects the balance-spring pivots. Dial: silver-toned microlight – chapter ring with Roman numerals – minute circle with Arabic numerals placed around the rim of the dial. Central date.